“Mind’s Material: Sensation, Cognition & Knowledge” at Shy Rabbit Contemporary Arts features the master works of Doug Pedersen, Kelsey Hauck and Karl Isberg. The exhibit, which runs through Oct. 7, is the first time the three artists have shown their work together, even though each has a long list of exhibitions and shows on their individual resumes. Pedersen started the education program at the Whitney Museum of American Art in New York in 1966. In one of several recent conversations, Pederson talked about being in New York, with artists such as De Kooning and Rothko. He mentioned being a poet and said seeing the unfinished work of Michelangelo is what made him want to be an artist. Michelangelo had done with his sculpture what Pedersen wanted to do with his poetry. From 1964-1969, Pedersen taught painting, art history and sculpture. 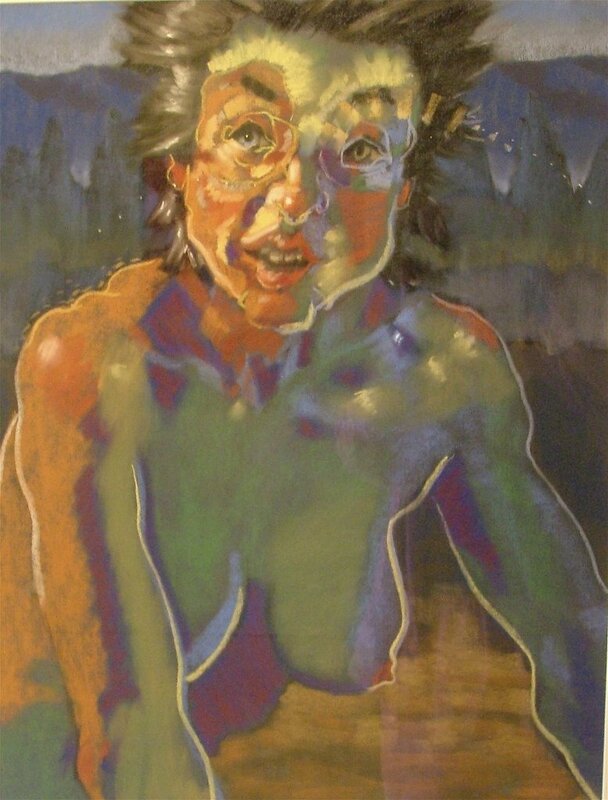 In 1985, he earned his MFA in painting at New Mexico Highlands University. He and Hauck have lived and worked in Majorca, Italy, Mexico, Spain, New York, Boston, Portland, Ore., Santa Fe and Taos, among other places. Pedersen has shown his work consistently since 1960 in New York, Pennsylvania, Connecticut, New Jersey, Boston, Santa Fe, Taos, San Francisco, Salida and Wurzburg, Germany. Hauck has shown since the ’70s in many of the same locations as her husband, Pedersen. Isberg co-owned 1418, Denver’s first alternative art gallery, taught art-related courses in the department of philosophy at Metropolitan State College, showed his work in the ’70s at the Denver Art Museum, at numerous galleries in Denver, at one of the galleries Pedersen and Hauck owned in Taos, and in several galleries in California. Isberg met Pedersen and Hauck in 1983 in Taos. They have been friends ever since. The human figure is key to each artist’s work, but each represents the figure in his or her own unique way. In the front gallery at Shy Rabbit are two early pastel drawings by Isberg, one a portrait of Pedersen, in dark reds and purples. Next to that is a drawing of a woman created in 1984, “Chris R.I.P.” Chris has short, black, spiked hair and blue eyes. She is drawn in shades of orange, green and violet, contoured in white and a hint of yellow. A shade light orange spirals around her eyes and yellow arcs above her brows. Over her right eye is an arcing mark that fades into white dots, somewhat like an antenna. Through Isberg’s expressive use of color and line he manages to capture the energy and aura of personality. Collages by Hauck line the wall in front of me. Her figures are created with multiple layers of paper to create depth, and color provides vibrant juxtapositions. Some papers are filled with text, Chinese characters, map topography and each portrait has an individual life as unique as humanity. I will say more about her work later. Pedersen’s “Contari,” a woman singing, is opposite Isberg’s pastels. The woman wears a thickly textured charcoal gown against a blood red background. Her mouth is open and one can imagine hearing an aria spilling forth into the room, the tension in her lips and eyes as she hits high C. Her hair is yellow and her face is also painted in shades of yellow and orange, illuminated by the lights on stage. The fourth wall in the front gallery features two of Pedersen’s collages, one made with a red bandana. Pedersen’s collages seem made of found objects and they are compelling. The dancing skeleton in “War God” is posed like John Travolta in “Saturday Night Fever,” dancing happily. It is an appropriate depiction of George Bush senior painted in 1991 during the first Iraq war. In the back exhibit space, the left wall is lined with more of Pedersen’s oil paintings, beginning with a piece with a green horizon and violet sky background setting off a white figure holding a bright orange and yellow mask. The mask is eerily similar to the face on the figure and when one gets very close to the canvas, the layers of color that Pedersen uses to achieve what appears to be white, reminds me of the theory of white light, that all color exists in white. Pedersen proves that to be true. The mask is colorful; the person is white. The mask conceals, but this person is removing his deceptive outward appearance. Masks represent the many types of human personalities encountered in life. A mask can allow a person to become the host of another spirit or being. As in many of Pedersen’s paintings, the mouth of the face is agape and the teeth are bared. In the middle of the wall is another painting with mask symbolism. This painting, “Figure Holding Two Masks,” features a turquoise blue background with a bright green horizon. One mask is on a stick and looks like the face in the painting. It’s almost like a shrunken head. The other mask is again very similar to the face. And, interestingly, the hands have no thumbs. 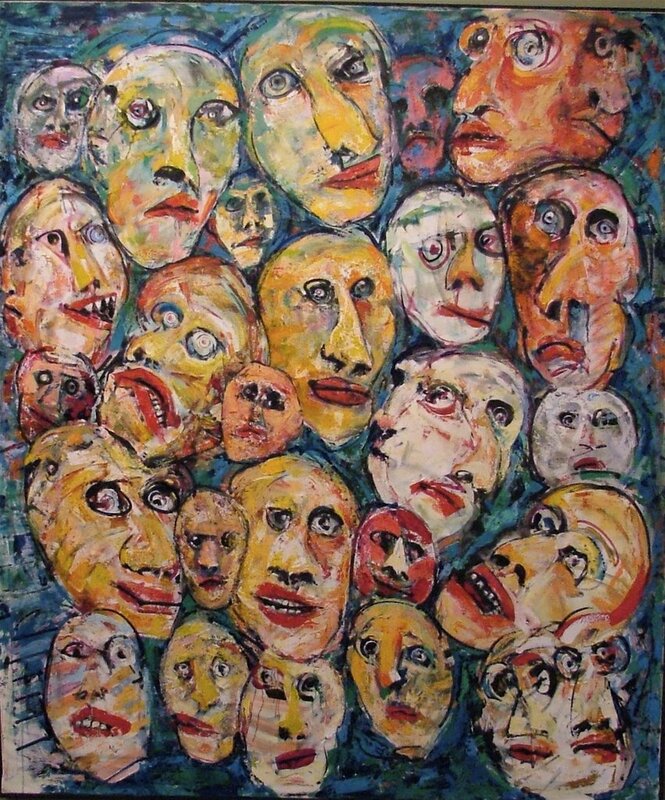 A large “Untitled” canvas with many heads, some happy, some grotesque, like a dream image, anchors the end of the wall. 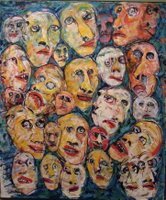 Pedersen’s paintings are heavy with oil paint and pigment in an almost German Expressionistic style, expressing a somewhat grotesque view of humanity with harsh colors and violent brush strokes. In “Head,” from 1997, paint spews forth from an open mouth, in “Head,” from 2000, an eye is blacked out, vacant and hollow. More of Hauck’s collage work lines the back wall. “Head” from 1989 is a small abstracted mask-looking collage, very graphic, with heavy black lines and lots of red. Next to this is “Bust of a Man,” 1996 – a man holding his head in his hand. His face is made from a topographical map and contoured with lime green nose and lips. He appears to be speaking out of the side of his mouth. Dark gray comes from his mouth like heavy, cold words. His head is tipped in despair, leaning on an invisible palm. This is a man trying to find his way in a less than hospitable world. 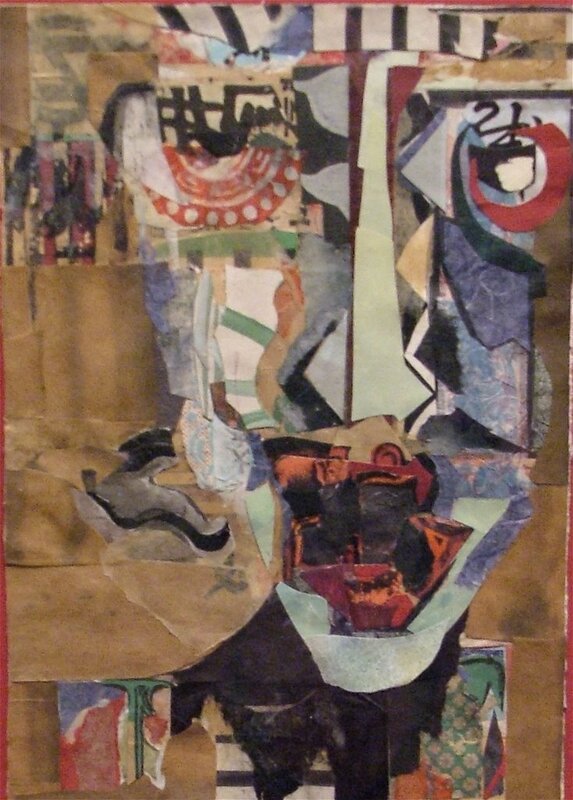 Each of Hauck’s collages is a unique being with a personality, perhaps images of people the artist has met or known, or characters she envisions the way a novelist creates character. They have a story to tell, if only the viewer will stand and listen. The other long wall in the exhibition space is filled with six acrylic paintings by Isberg. Two larger, muted canvases are created by painting the canvas black, then building layers of color on the ground. The first canvas on the left is the darkest of them all, cool in shades of blues and grays. It is called “Jupiter Eating His Children,” and is of two boxy abstracted figures, one with what looks like the shape of a duck in its mouth. Next to it is the warmer painting, “Love is Funny When You Don’t Like Each Other,” featuring two primitive, cubed figures with tubes and spirals, echoing the spirals in the pastel drawing of Chris in the front gallery, with similar arcing antennae extending from the head. They have big, boxy heads with eyes, long sausage noses. The figure on the left has lips. The legs are boxy with spiral cinnamon roll knees. It’s hard to tell the gender of either figure. The one on the left has a sausage in an anatomically correct location for a male. The figure on the right has what appears to be large, sticky bun looking breasts. A hand reaches across from the figure on the right to touch the figure on the left. At least it looks like a hand, with three fingers. I think the figures are hermaphrodites and the painting reflects the confusion of gender roles in modern marriage. There is sexual tension in the painting, physical groping. We grow and change during our lifetime and in marriage that often means we take on new roles. This painting captures the idea of compatibility and companionship that come after being together a long time. Marriage is hot and cold and so are the colors of paint used in this painting: earthy caramels contrast with cool blue-grays. The rest of the paintings by Isberg are smaller canvases painted more brightly, in yellows, golds, oranges, moss greens and sienna, with bug-eyed, cartoon-like images. “Just Outside the Rijksmuseum” is of two figures made from what appear to be fruits and vegetables. Or as one of the writer’s from “Brown Bag Writer’s” put it, it looks like two Kachinas celebrating the harvest. There is food all around, but the two figures seem to be devouring the same item. Isberg uses color and geometry in his painting to express emotion and capture snippets of life, but he challenges us to view those snippets in a compelling way. Pedersen said that art is observation. If so, then the world that these artist’s observe is ferocious, humorous, expressive, vibrant and very much real. It is a world worth exploring. “Mind’s Material: Sensation, Cognition & Knowledge” is on display through October 7, at Shy Rabbit Contemporary Arts, 333 Bastille Drive, Units B-1 and B-4. Regular hours are Tuesday, Thursday and Saturday 1-4 p.m. with extended hours on the second Thursday of the month from 1-6:30 p.m. For more information: log onto http://www.shyrabbit.blogspot.com or call 731-2766. Leanne Goebel is a freelance arts journalist and a member of the creative development team at Shy Rabbit Contemporary Arts. October 2, 2006 in ART.